NEWPORT, R.I. — Two quarterfinal matches at the Hall of Fame Tennis Championships on Thursday set up a semifinal between Michael Russell and Nicolas Mahut. American Michael Russell came into Newport after a victory at last week’s Manta Challenger, played on hard courts in Ecuador. Today, he battled for 2 hours and 40 minutes to defeat No. 3 seed Igor Sijsling 7-6(3), 6-7(6), 7-6(5). Russell did not have match points in the second set. In the third-set tiebreak, he came back from 0-3 to win six straight points to take a 6-3 lead. The win is Russell’s second tour-level semifinal of his career (Houston 2012). The match was the first three-tie-break marathon at the Hall of Fame Tennis Championships since 1993 (Rusedski-Antonitsch). Next on court, Newport’s 2007 runner up Nicolas Mahut defeated Poland’s Michal Przysiezny. Mahut is 10-2 on grass this season. Russell and Mahut will meet in the semifinals on Saturday. 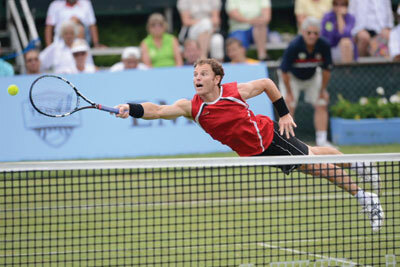 Quarterfinal action at the Hall of Fame Tennis Championships continues tomorrow. In the first singles match on Center Court, big servers John Isner and Ivo Karlovic will fight for a spot in the semifinals. Isner is the two-time defending champion at Newport. Karlovic has been enjoying a successful run at the event this week, which is his first tournament since April, due to illness. In addition to advancing to he singles quarterfinal, in doubles action today, Karlovic and his partner Divij Sharan saved four match points in a match tie-break to beat Adil Shamasdin and John-Patrick Smith 6-4, 4-6, 19-17, setting the record for the longest match-tie-break of the season. See below for Thursday’s results and Friday’s order of play.